Browse our stories to learn about the importance of mission-oriented banks first-hand, from the clients themselves. Our communities are at the heart of everything we do. 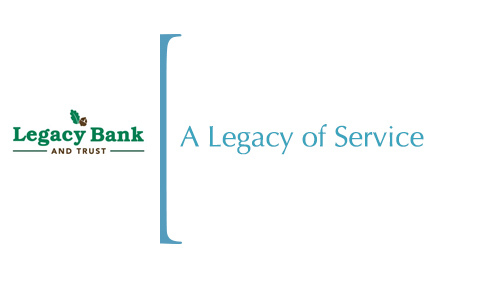 Legacy Bank and Trust is built on our core values of Respect, Commitment, Integrity and Teamwork. These values set the tone for how we operate both internally and within our communities. Our passion for others reaches far beyond the walls of our Bank and is evidenced by our unfaltering commitment to our communities and associates. At Legacy Bank and Trust, we exist to serve as the financial leader in economic and community development by providing financial products and services to the largely underserved populations in our markets. Our associates and shareholders are committed to partnering financially with customers to ensure vital capital investment in our communities. Since our first bank opened its doors 1907, our vision has been to surpass standards in banking for our customers and local businesses so they have the ability to help our communities thrive. Through a dedication to innovation, local growth, and building strong relationships, we strive to make every customer one for life.